Our DPSN theme for September is “environment”. We were wondering what our bloggers think about their environments – be it in relation to their personal space, workplace, where they socialise or in their communities. We wanted to hear their thoughts about the environments that they live in, how they have changed over time, or how they think they might develop into the future. We’d like to hear your views too, so let us know in the comments below, or jump over to our Facebook page to join the conversation. Hall defined the idea of “personal space” as the environment directly surrounding a person, which they regard as psychologically belonging to them. People carry their personal space wherever they go and most people highly value it, feeling uncomfortable when other people encroach on it without permission. Conversely, allowing a person to enter your personal space is an indicator of the closeness of your relationship to them – with the innermost circle usually reserved for intimate partners and close family/friends. Where this becomes interesting is in environments where it is difficult to maintain any personal space at all. For example, very crowded situations in public. In these cases, Hall thinks that other means might be used to maintain a sense of ownership over someone’s personal environment. For example, avoiding eye contact. I observed some of the different ways of maintaining personal space in crowded situations when I was living in Japan, a country of more than 100 million people. 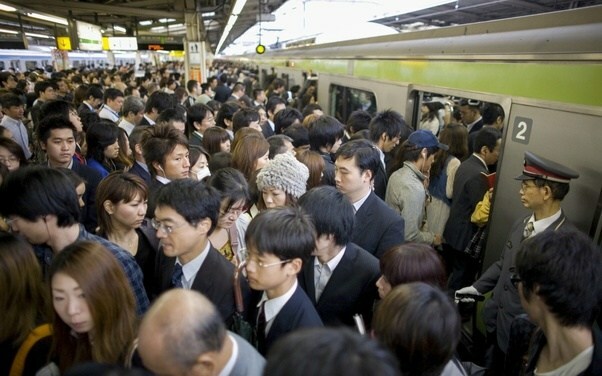 In Tokyo, some public spaces (public transport in particular) can be absolutely jam packed. I was often standing shoulder to shoulder on trains in peak hour commuter traffic, with station wardens actually pushing people inside the doors of trains before they would take off. But there are a number of social norms that are unique to Japan, which I think help to maintain a sense of personal space, even in these overcrowded conditions. For example, it is considered rude to speak on your cellphone on a train – to avoid disturbing the peace of other passengers – and most commuters will switch their phone to silent while aboard. It’s also rude to talk noisily in general on public transport, to smoke (even though smoking is still allowed inside restaurants, bars and other buildings), and there are clear rules about how to line up orderly to board a train (allowing others off first) and avoid general chaos. All of these things help people to maintain a sense of order and control in a situation where personal space is limited, if not non-existent. A country which seems to sit in polar opposite to Japan’s order and regulation is Vietnam. I was lucky enough to travel from one end of the country to the other for three weeks earlier this year. To a tourist it seems that in Vietnam almost every person owns a scooter! In some of the older parts of the city the streets are extremely narrow and crowded, full of storefronts, and road rules are only a loose suggestion. 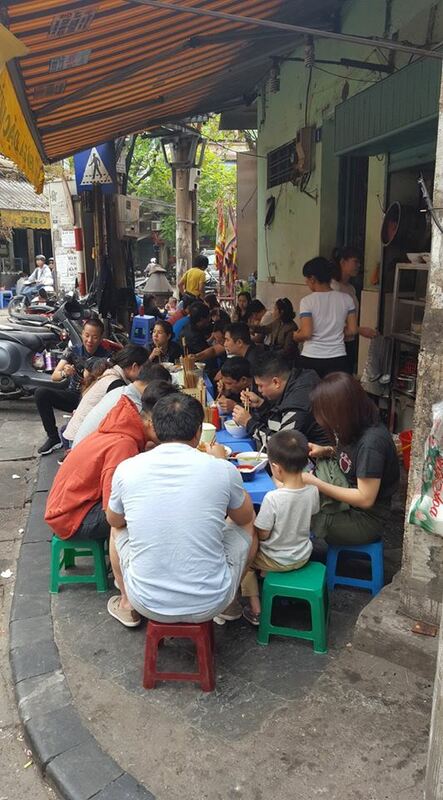 This results in mad chaos of vehicles, pedestrians, people selling various items, cooking, cleaning, eating, and living – right on the street-front. While a lot of people seemed to use their close quarters living to connect and spend time with family and friends, I did notice huge amounts of people sitting at the myriad coffee shops with their heads down staring at their smartphones (usually either playing games or watching videos). The start contrast between someone literally cooking a meal at a small road-side charcoal grill, or carrying baskets of produce for the market, and a group of teens drinking coffee and playing on smartphones was remarkable. But I wondered if in this case people were using technology to maintain a semblance of personal space, in a country with one of the fastest population growth rates in the developing world. These observations made me think about what methods we use in New Zealand to maintain our personal space. I suppose we are lucky in that we live in a country with a far lower population density, although like most places this is ever growing. One thing I have noticed, and often use myself, are headphones. I work in a large open-plan office, where it can be extremely difficult to concentrate due to the general noise level. Although this can make it hard to get things done where you are busy, I don’t like to tell people to be quiet, particularly since at times when I’m less busy I like to catch up with colleagues as much as the next person. Using a pair of headphones and playing music has been a fantastic way to both concentrate and get some work done, as well as politely signal to others that I’m in “busy work mode”. So how do you maintain your sense of personal space? Particularly in situations where this is at risk of being encroached on. Let us know in the comments below.